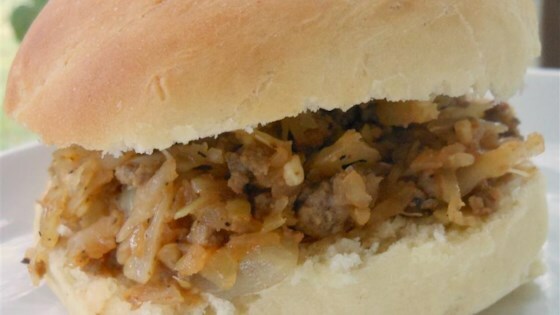 "Originally from Iowa, Runzas were a staple in our family dinners. Usually the beef and cabbage mixture was stuffed in fresh bread dough. This is an easy and quick variation that is a great way to get kids to eat their vegetables! My 10 year old son loves them." Brown ground beef in a large skillet over high heat. Drain fat. Stir in garlic, onion, and cabbage; cook until vegetables are wilted and soft. Stir in the beef broth, Worcestershire sauce, and mustard. Cook over medium heat, uncovered, until reduced to a sloppy joe consistency. Season with salt and pepper. Place hamburger buns on top of meat mixture; cover skillet to steam, about 1 minute. To serve, fill steamed buns with beef and cabbage mixture. I remember eating runzas from a german bierock shop...but these were not it. Sorry. no one in my family liked these at all. I added a small can of tomato paste, which I think improved the flavor a great deal. I can't pinpoint it, but it tastes familiar somehow. Good use of cabbage! WOW! This was great...even my very very picky 7 year old asked for more and I can not stress how picky she is.